ReBUTTal: Is Anime REALLY Anti-Pepsi? Contrary to popular belief, the ButtBuddz is not actually a weeaboo establishment; For as much as we write about, say, Hidamari Sketch, we also like western stuff such as Swing You Sinners! as well. Anime (and by extension, anime styled video games) is only one piece in the pie that is “Stuff the Buttbuddz Like”, and a fairly small piece at that. However, a recent article that could be considered our first ever “Bruticle” (term coined by Nobaddy) had been posted, and well… It’s no What Kaiserreich: Legacy of The Weltkrieg’s Second American Civil War can tell us about the world we live in today, to say the least. It’s time to bunk some myths about Pepsi and anime, or in the very least, consider this article -the very article you’re reading right now- a critique of some kind. First off is the What Japan Thinks chart/poll mentioned in the original article; Luckily for everyone here, What Japan Thinks is a very good source. In fact, it’s such a good source that it even mentioned its sampling of the population and the statistics involved! For reference, the amount of people who live in Japan is about 127 million people. The poll only represents the opinions of a mere 0.000003% of the country’s population. How can one say that it represents Japan’s opinion on Pepsi as a whole? Even if turns out that there aren’t a lot of Pepsi drinkers in Japan, Pepsi still makes non-anime-related efforts for their market such as their beloved mascot Pepsi Man, and all sorts of fun, Japan-exclusive flavors such as Pepsi Sakura, Pepsi Salty Watermelon, Pepsi Blue Hawaii, and Pepsi Mont Blanc, among many others. 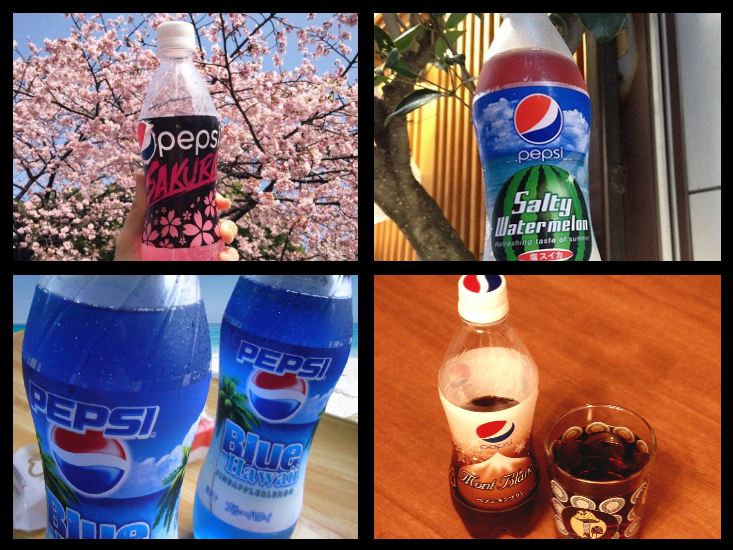 This is only a small sample of the many Pepsi varieties that have been released in Japan over the years. 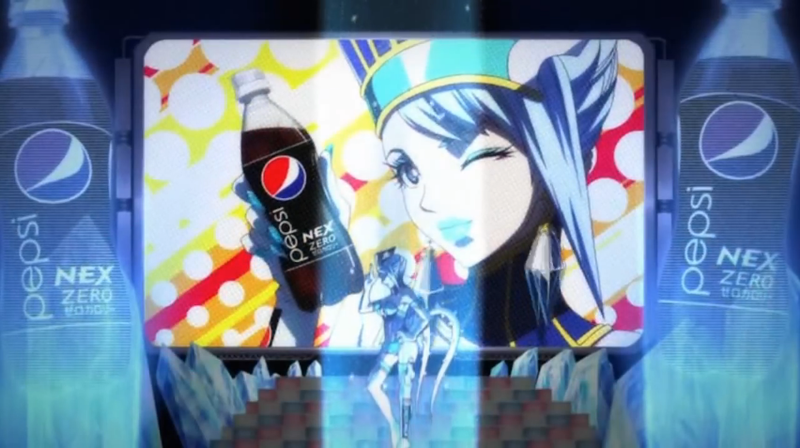 This leads into our next topic; Pepsi’s advertisement in the anime Tiger & Bunny. First off, judging an anime (or any piece of media, for that matter) by its name is like judging a book by its cover; It’s not an accurate way to tell if the show is good or not. Rather than talking about the title, let’s get onto the show itself; The lady featured in the advertisement, Blue Rose, is actually sponsored by Pepsi for the entire anime. She’s also a superhero, so she’s basically the anime equivalent of Pepsi Man. While I haven’t actually seen Tiger & Bunny either, if we calculate the review scores to get an mean-average score for the show, it’s apparently as good as Batman Begins. (Or at least Rotten Tomatoes and IMBd’s opinion on the film.) This proves that Pepsi only approves the finest productions for its sponsorships. If you want to see what a truly BAD sponsorship looks like, perhaps we should have a look at the works of Pepsi’s rival company, and the drink of brutes everywhere, Coca Cola. 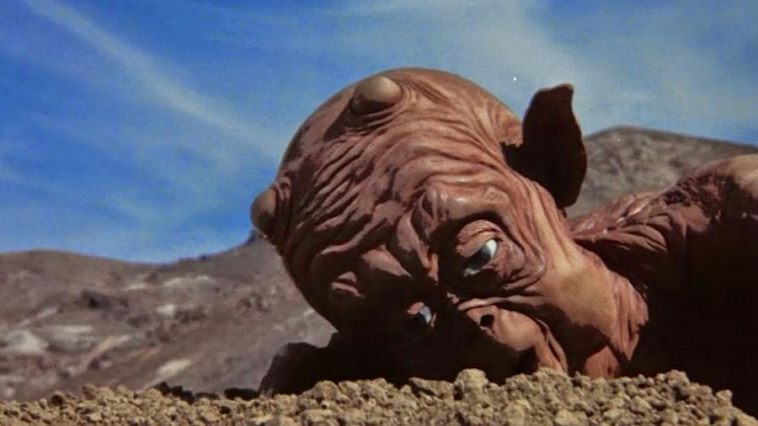 CASE STUDY: MAC AND ME. While Coca Cola brags that it’s appeared in many, many famous films over the years, the first film that comes to the mind of the average person is the 1983 film, Mac and Me. To say that Coca Cola sponsored it would be a severe understatement; It’s Coke in film form! What IS a surprise though, is that they had a promotion with Pepsi that at least got to concept art level. Spongebob really is pro-Pepsi! Clearly, while Spongebob and every other fish-related cartoon are pro-Pepsi/pro-fish and therefore good, does it hold up for the rest of the western animation? I’m sure the “patriots” at Hanna-Barbera would like to disagree with you. If that’s not an excuse to bring our scooby_doo_desecration channel back, I don’t know what is, and yet anime‘s supposedly the anti-Pepsi one… As far as finding pro-Coke stuff for both types of animation went, (not counting fan-made videos for either, because there were A LOT of those; the same thing applies with pro-Pepsi videos, too) they actually had about the same amount of Coca Cola sponsored content; It doesn’t matter if you’re The Simpsons or One Piece, you’re still not immune to being an advertisement for Coke. Ultimately, anime is just as capable of being pro-Pepsi as any western medium can be. Likewise, western media is still capable of being pro-Coca Cola and unpatriotic. Anime is still part of Pepsi, and by extension, the Buttbuddz; Whether you love it, or hate it, it’s here to stay. Remember to subscribe to your local Buttbuddz today! An art style can make or break an anime; For example, an art style with a superb use of color theory can enhance an anime, but one with a complete lack of understanding anatomy would absolutely ruin it. However, there’s one element of an anime’s art that stands above all the others, ready to wreck devastation onto the animes that don’t use it: We’re, of course, talking about the funny faces. Anime fans everywhere know that funny faces are a staple and a signifier of a good show; These expressions are an indicator that you’re in for a good time, whether you’re watching the anime itself or just simply posting about it online. It’s basically telling its viewers “Are you ready for fun? Because it’s time to have fun!” After all, who doesn’t like to have fun? 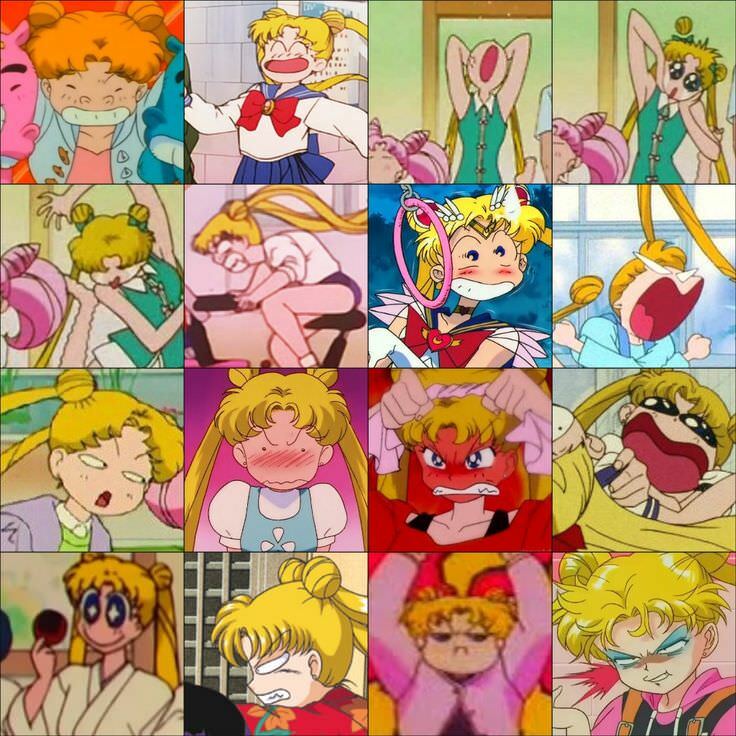 There’s a reason why we use Sailor Moon the most out of the three pillars of Comica approval. To start our analysis of why funny faces are pivotal to successful anime, we’ll have to go back to anime’s humble beginnings: Anime originally started in the 1910s, much like many other cartoon industries from around the world. Not unlike the rest of the world, Japan was following in the same footsteps as everyone else: They took up sound when it was invented, they took up making animated feature films when they realized they could do that, they then— Well, you get the idea already. Predictably, this would lead Japan to follow in the footsteps of western animation companies such as Disney and Fleischer Studios, and become inspired by their expressive characters. In fact, Japan liked them enough, Fleischer Studios even sent Betty Boop over there to perform once! …That, and the fact that Donald Duck basically invented modern anime/manga. How could we ever forget about his influence on anime? 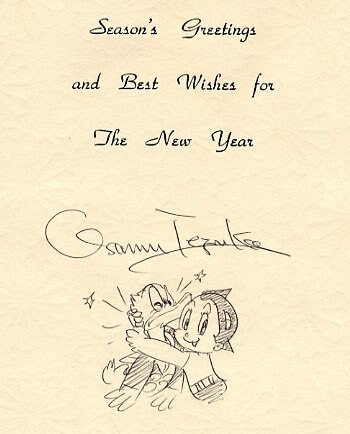 Pictured: Osamu Tezuka (And his character, Mighty Atom/Astro Boy) wishing Donald a happy new year! While anime characters have always been expressive due to their traditionally-cartoony roots, another element would later come into play of the effectiveness of funny faces: Reaction images. You see, all of these animation companies made sure to consider the classical principle of “emoticons” in their work. Dating back to a simple drawing of a smiley face in 1653, emoticons were instantly incorporated into animation to help make their characters easier to draw (especially repeatedly) than having to draw realistic human faces for nearly every frame. However, it wouldn’t be until 1982 that the idea of emoticons being used digitally was taken into consideration. As the internet and other digital mediums grew, people began to develop new kinds of emoticons to use in their communication, such as smilies, sideways emoticons, kaomoji, emojis like the ones in The Emoji Movie, -and of course- using gifs/pictures of shows to express one’s feelings. 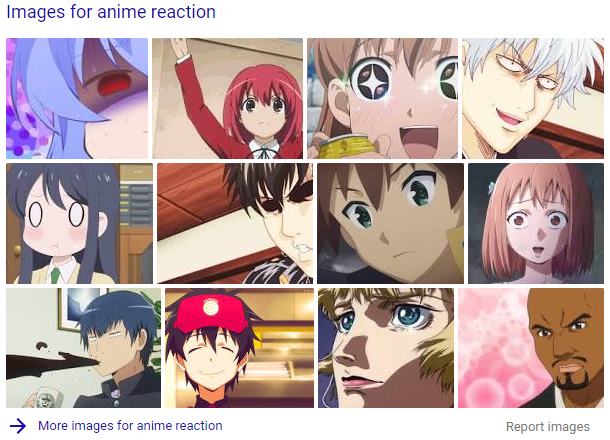 Naturally, anime funny faces ended up being a common occurrence among all of the gifs and pictures people used. Meanwhile, back in the anime industry, all of the companies were starting to notice that images of their show’s funny faces were starting to be posted nearly everywhere online. Originally, the anime industry was considering suing everyone who used reaction images into oblivion, but as soon as they noticed all of the “what anime is this?” comments near many of the anime funny faces, it turns out they found free advertising for the shows themselves. As soon as many studios released again how much impact funny faces could have on their anime (getting people attached to their characters, free advertising in the form of reaction gifs, its fun to draw and animate, etc.) they made sure to provide plenty for their audiences to enjoy. However, what happens to an anime that doesn’t use funny faces? Maybe it’s a deep, serious drama that can’t see itself using wacky expressions? Perhaps they spent too much of the animation budget on special effects? Or maybe they’re just complete brutes who don’t like people having fun while watching their shows? Proof that an anime with funny faces is better than one without faces faces. However, what if an anime is nothing but funny faces? One example would be the soon-to-become-an-actual-anime, Pop Team Epic; It plays with this idea, having it’s main characters faces always look adorable and funny, while engaging in all sorts weird, oddball scenarios, mainly since it’s a comedy series. Pictured: Pop Team Epic‘s homage to anime’s early Disney roots. 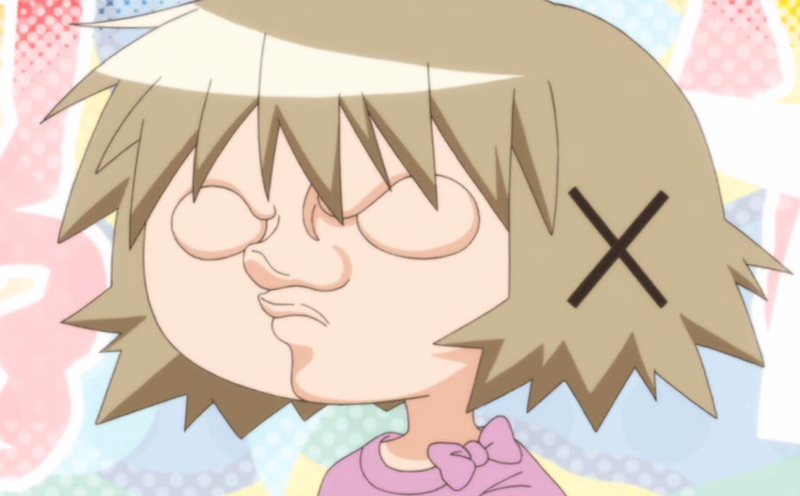 In conclusion, anime funny faces is a time-honored tradition dating back to the 1930s that also still holds up to this very day, and very likely into the future. Everybody loves and relates to them, they’re fun, and they’re an indicator of whether a series is truly good and worth watching, especially as we go further into the digital age; Wherever there’s pictures, there will be anime funny faces! What’s up Pepsi fans today I’m going to show you the shocking parallels between Kaiserreich: Legacy of The Weltkrieg’s Second American Civil War and the Second American Civil War in our timeline. As you can see there’s a lot going on in this picture but we can pick out some very important details. Even MORE proof that the west coast is the worst coast? 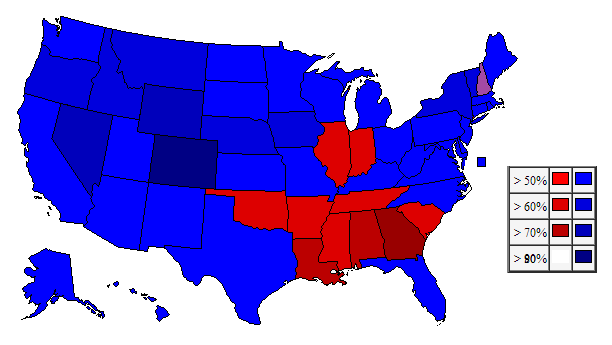 That’s right, as shown in this only the states of the American Union State and Combined Syndicates of America support coke, while the rest of the United States supports Pepsi. In fact, Colorado has an 80% approval rating for Pepsi, could this mean Pickles is a closeted Pepsi drinker???? Find out next article on the buttblog, and don’t forget to subscribe to the Buttbuddz and share this article with your friend if it enlightened you. How MGM’s 1930’s police procedural series Crime Does Not Pay influenced modern Magical Girl anime. Apparently everyone’s been waiting years for this article, but if this was released earlier, not much would’ve changed; The Magical Girl genre -as a whole- has been rather “stagnant” within the 2010’s, with all of it’s reboots, and sequels, and other things. In this analysis, the influence of Crime Does Not Pay that’s slowly seeping it’s way into the genre will be looked at with a critical eye, and plenty of appreciation of it’s brilliance. Crime Does Not Pay is a theatrical crime-genre series of short films by MGM that ran in theatres from 1935 to 1947. The Crime Does Not Pay series revolves around one-off short stories starring police officers, detectives, and criminal justice workers of all kinds solving the crimes surrounding them. It also had a spin-off radio show that ran from 1949 to 1951, and a crime-genre comic series by Lev Gleason Publications that -while both have the same title- are not actually related. 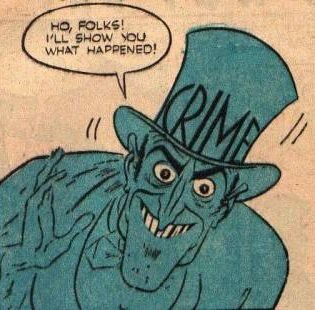 For example, the comics have a consistent character in the form of Mr. Crime, a brutish narrator character who also eggs on the criminals of the comic’s short stories. However, -as the writer of this article doesn’t own the “COMPLETE SHORTS COLLECTION” and also wasn’t able to find any of the films on the internet aside from Don’t Talk, a WWII-Propaganda piece about industrial espionage and defense manufacturing- most of the information regarding Crime Does Not Pay used in this analysis had to come from the radio dramas based on MGM’s films, and assorted IMDB articles. As far as Crime Does Not Pay‘s influence on the magical girl anime genre goes, it wasn’t always there. While their worlds still have cops and other law enforcement, traditional crime series elements ended up taking a backseat to the sparkles, teamwork, occasional romance, and threats too huge for many criminal justice fields to even deal with, let alone defeat: That’s where the magical girls come in after all. It would take years before Crime Does Not Pay would ever influenced their genre. Enter the early 2000’s, the very end of the “classic” era and the very beginning of the “Modern” era. After Sailor Moon ended in 1997, Toei Animation had been going through new magical girl series on a regular basis; At one point, they demanded an anime producer by the name of Washio Takashi to make a series for them, as they needed something to fill another show’s soon-to-be-empty time slot. However, there was problem; Washio Takashi wasn’t familiar with any “shoujo” genres, let alone the *~Mahou~* Shoujo genre. 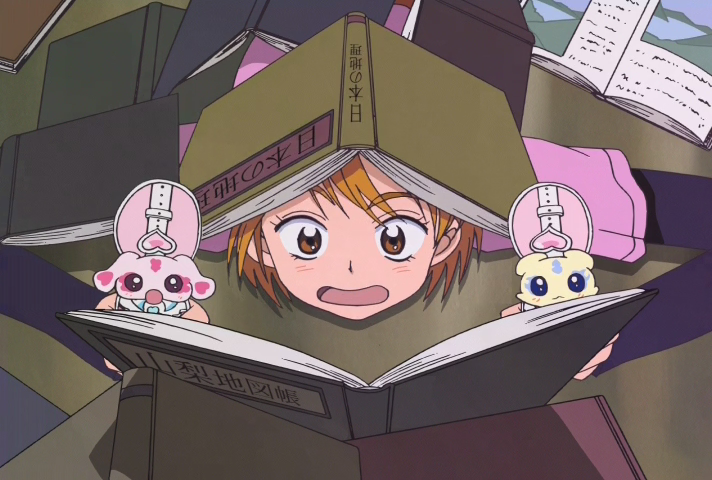 Hoping to solve his writer’s block, Takashi watched a few episodes of his favorite classic crime series, Crime Does Not Pay for inspiration: As the daunting tales of detectives and crimes filled his head, he decided to bring a lot of elements from the show into his and Toei Animation’s Izumi Todo’s newest magical girl show; Futari wa Pretty Cure. 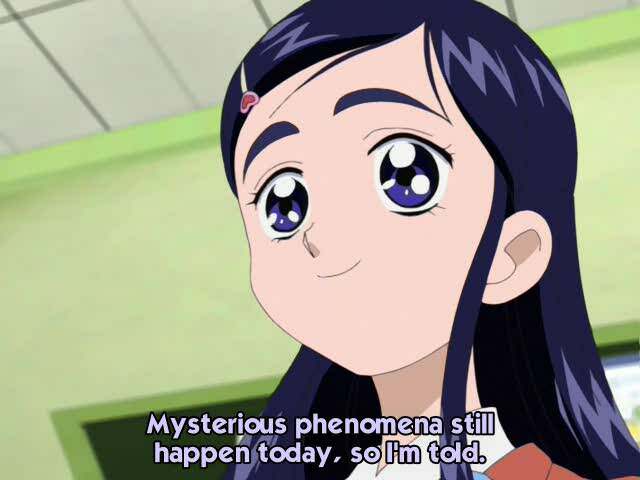 Futari wa Pretty Cure ended up premiering on TV Asahi in February 1, 2004. (Even though the show looks an entire decade older than it actually is.) The anime stars two girls: Nagisa Misumi, and Honoka “The Queen of Knowledge” Yukishiro. Nagisa, -like a true crime detective- doesn’t play by the rules, but by a sense of justice; She hates that innocent people get hurt for things they had nothing to do with. Nagisa’s outfit has pink in it, therefore making her the main character. Honoka, on the other hand, is a member of the chemistry club, therefore making her a professional chemist not unlike how many of the crime solvers in Crimes Do Not Pay are professionals at their jobs. After finding two talking cellphone critters, and becoming magical girls as a result, Nagisa and Honoka use their newfound powers and friendship -as Cure Black and Cure White respectively- to stop evil such as brutes, card-counters, and card-counting brutes. Nagisa and Honoka’s great criminal-catching skills in action. In the end, justice wins every time: The crimes get solved, and Nagisa and Honoka -like Crime Does Not Pay‘s narrators- reflect on the mysteries of the human psyche and the crimes surrounding them. They don’t call her “The Queen of Knowledge” for nothing. Futari wa Pretty Cure ended up being a massive success, spawning not only a direct sequel and two movies, but countless spin-off seasons as well, each detailing the lives of various different teams like the original Crime Does Not Pay does with it’s crime solvers with each new short film; One film it would’ve been police inspectors, another would have FBI agents. 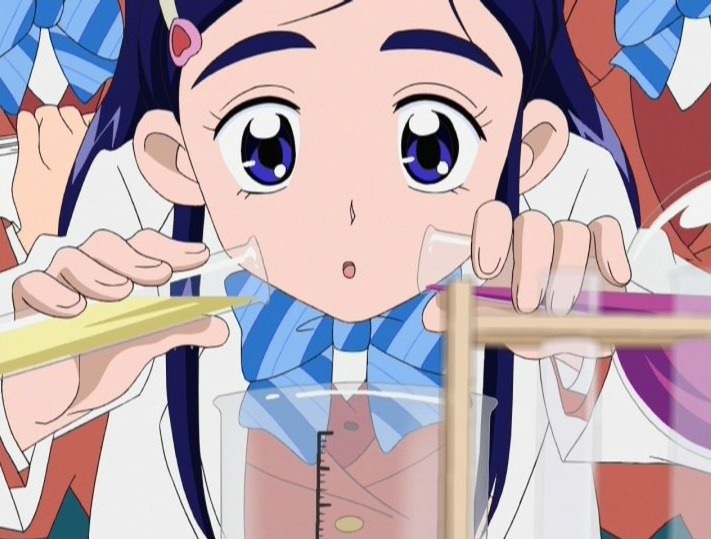 Precure (the abbreviation for the franchise as whole) seasons past Futari wa Pretty Cure work much the same way; One season you’d have a chemist like Honoka, but another season you’d have a character like Splash Star‘s artist, Mai Mishou, instead. 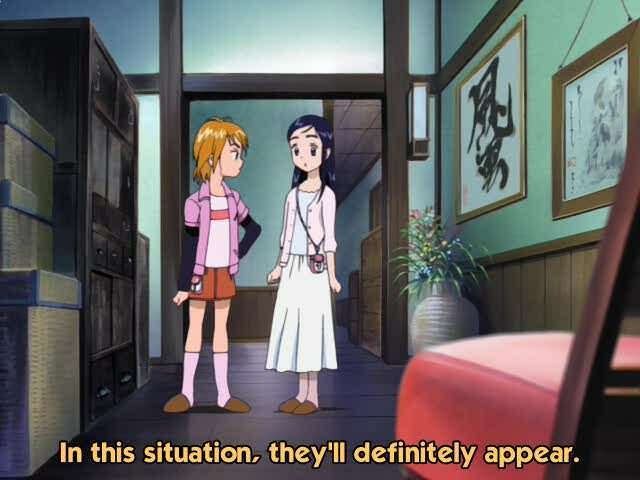 While the amount of Crime Does Not Pay‘s influence varies from installment to installment of the franchise, sometimes it gets even more obvious than it was in Futari wa Pretty Cure itself. 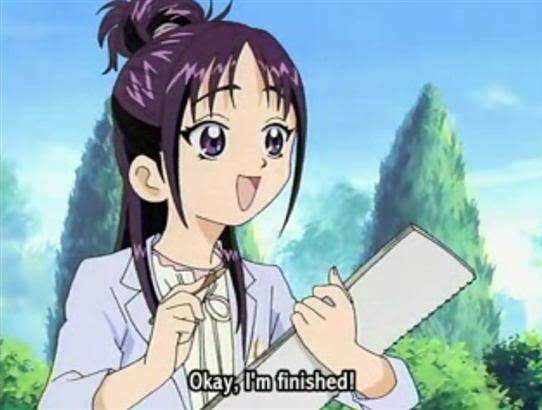 Mai Mishou, now finished with her latest forensic sketch. A good example would be from the tenth anniversary season, 2014’s Happiness Charge Pretty Cure, which makes its influences incredibly obvious through it’s use of “Precards”; Not only dues it reference Futari wa Pretty Cure‘s similar (but unnamed) cards, but some of the cards, -such as the detective or police Precards- are references to the original Crime Does Not Pay series itself. (Complete with being able to be used by the non-magical forms of the protagonists, for that nice, classic crime fiction feel!) Conveniently, there’s clips of these forms already posted on YouTube, so here they are for the sake of evidence.